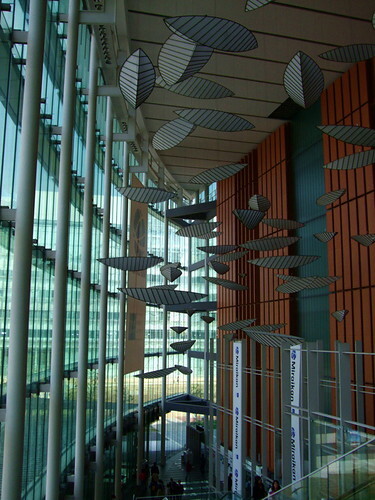 The Miraikan, or the National Museum of Emerging Science and Innovation, is located in the Odaiba area of Tokyo. The building is an awesome cavernous glass structure in an ellipsoid shape. It’s filled with light and dangling from the ceiling are large glittering leaves. It reminded me of the International Forum in Yurakucho, another all-glass oval-shaped stunner. But I like the Miraikan better because there is a more intimate feel, with all the floors connected visually. 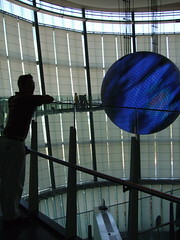 The centerpiece of the museum and the building is an enormous electronic globe. The image of the world rotates in real time and it displays things like the current weather and global temperature. You can view it from below in lounge chairs or you can look at it from any of the museums floors. It was mesmerizing and beautiful. Some highlights of the museum include a real space capsule and a submersible. The most informative display was the picture, name and nationality of every human, dog and monkey who has ventured into space, grouped by year. It was fascinating to see how the Soviets and Americans dominated space travel for a few decades, but now it’s becoming truly multinational, with more Chinese, Japanese and Europeans leaving the atmosphere. While the permanent exhibits are worth a visit, you shouldn’t miss the special exhibit, The Science of Aliens. The exhibit is separated into four zones. The first one looks at aliens in the public imagination and popular media. For instance, there is an Ewok costume and a scale model of an alien from the Alien movie series. It traces the way we have projected our fears and hopes on imagined extraterrestrials. The second zone looks at the strange life forms that are on our planet, showing us that an alien could be nothing that we can even imagine. There were samples of life on earth that exist in the most extreme environments, from super hot to bone-crunchingly cold to oxygen-depleted. That was eye-opening. The third zone took us on a tour of attempts at communication with aliens. It had the complete recordings of Voyager, which we could hear samples of. And the fourth zone had an interactive imagined alien ecosystem. Overall, a comprehensive and totally cool exhibit. Both the permanent exhibit and the special exhibit are reasonably priced at 500 yen and 350 yen, respectively. It’s a great place for kids. And if you have time you can visit the nearby Maritime Museum, walk around the surrounding park, and shop and dine in the Venus Fort, an indoor mall complex that mimics the interior of a Las Vegas casino. T and I went to the 4 storey game center and went bowling and sang karaoke, sending messages of our own to other worlds.